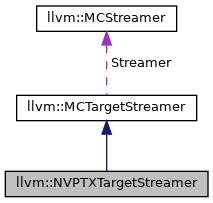 Definition at line 18 of file NVPTXTargetStreamer.h. Definition at line 23 of file NVPTXTargetStreamer.cpp. Definition at line 83 of file NVPTXTargetStreamer.cpp. References assert(), llvm::MCStreamer::getContext(), llvm::MCContext::getObjectFileInfo(), llvm::MCTargetStreamer::getStreamer(), llvm::MCObjectFileInfo::getTargetTriple(), isDwarfSection(), outputDwarfFileDirectives(), and llvm::MCSection::PrintSwitchToSection(). Definition at line 33 of file NVPTXTargetStreamer.cpp. According to PTX ISA, CUDA Toolkit documentation, 11.5.3. Debugging Directives: .file (http://docs.nvidia.com/cuda/parallel-thread-execution/index.html#debugging-directives-file), The .file directive is allowed only in the outermost scope, i.e., at the same level as kernel and device function declarations. Also, the order of the .loc and .file directive does not matter, .file directives may follow the .loc directives where the file is referenced. LLVM emits .file directives immediately the location debug info is emitted, i.e. they may be emitted inside functions. We gather all these directives and emit them outside of the sections and, thus, outside of the functions. Definition at line 38 of file NVPTXTargetStreamer.cpp. This is used to emit bytes in Data as sequence of .byte directives. Definition at line 104 of file NVPTXTargetStreamer.cpp. References llvm::StringRef::bytes_begin(), llvm::MCTargetStreamer::emitRawBytes(), llvm::MCContext::getAsmInfo(), llvm::MCStreamer::getContext(), llvm::MCAsmInfo::getData8bitsDirective(), I, llvm::StringRef::size(), and llvm::MCTargetStreamer::Streamer. Outputs the list of the DWARF '.file' directives to the streamer. Definition at line 27 of file NVPTXTargetStreamer.cpp.